The How To Keep Your Volkswagen Alive book was published by John Muir in 1969. There is no way he could have known then that this book would become the classic that it has become. This is the nineteenth edition and it has been through fifteen printings. That is some success! This book was specifically written for air-cooled VWs. It focuses on the Types I, II, III, IV and fuel injected models, with 1200, 1300, 1500, 1600, 1700, 1800 and 2000 engines. The content is very easy to understand and will provide you with a great understanding on just about any situation you will encounter with the air-cooled VW. 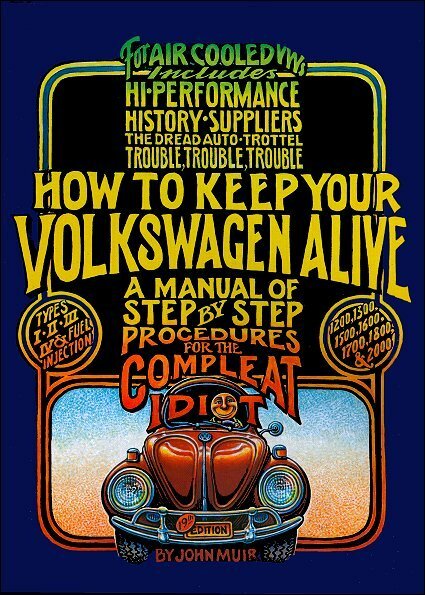 The How TO Keep Your Volkswagen Alive includes step-by-step procedures and is heavily illustrated. If you own or know someone who is an air-cooled VW enthusiast, this repair manual is a must-have manual book for your toolbox. 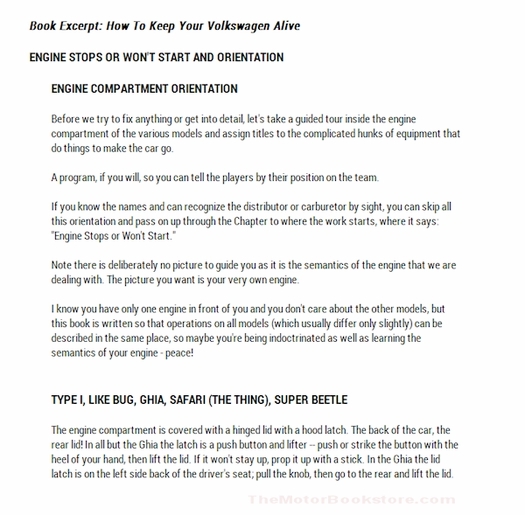 The Keep Your Volkswagen alive book includes detailed instruction and procedures for the following air-cooled VW topics: high performance modification tips; trouble shooting techniques; engine overhaul; how to fix front end shimmies and shakes; clutch slips and jerks; transaxle grinds and growls; and much, much more. Ask a question about John Muir's How To Keep Your VW Alive. This book has so much detail on how to do the work. I love the drawings. My boss recommended this to me. He said it saved him big bucks by doing the work himself. That was over 30 years ago. I am so glad this book is still in print and revised. Now if I can only find the time to get my 1977 convertible super bug up and running! Service was excellent too, got my book in a record time. I have never been interested in automotive stuff. Recently I bought a VW trike and i want to learn to do some of the basics. This manual will help out alot and its really entertaining for me and not boring. Thank you for making it so interesting. A lot of info in book,but not well organized or laid out well. Some info on rear suspension not there.